Hi guys, Ryan here from Melee.co. 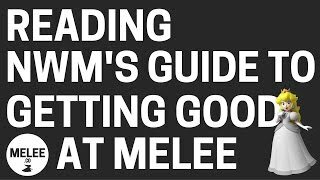 Today I’m going to be reading through for the first time NMW’s Guide to getting good at Melee. I was watching an interview with NMW and he talked about a few different articles that should be read by new Melee players to become good at them. One of them is his guide; there was another one by Wobbles; there was a few more in there and there was one by PPMD on how to practice on your own and one by Little England as well and the Four Aspects of Melee by Wobbles. So what we’re going to do is basically I will be working through these. I didn’t have a lot of time to practice Melee. I run my own online business; I’m married; I have three children and so I don’t get a lot of time to practice. I guess I’m trying to be smarter in the way that I practice. Yesterday we went through a previous game of mine and I’m trying to analyse myself and get better at that which apparently is a way to get faster and another way will be reading articles. There is this great Google document called The Melee Library. If you haven’t seen it I am going to link up to it – just go to Melee.co/library and you will link up to that. It’ll be someone else’s copy but if you go – I think there is one setting up here where you can go to file, make a copy and then you can have your own copy in Google Drive and you can highlight things like I have done. So go to www.melee.co/library that’s read only but if you make a copy you can make edits to it if you want. Here we have the NMW’s Guide to getting good at Melee which is on Reddit so let’s go ahead and have a look at that. I’m going to read it through to you guys and it’s quite long but it’s not too long and I’m going to take notes and talk about it as I go through it. NMW’s Guide to getting good at Melee: Plateaus exist at all levels of play in competitive gaming. Rather than lack of practice keeping players from improving, it is usually a lack of knowledge about how to practice intelligently. MIOM, which is Melee It On Me has had some articles about how to improve and I hope to add to those by going through a basic flowchart of how to advance in Melee. The optimal way to improve is to learn things in an order based both on ease and usefulness. Though this list is stratified, the transition of focus is gradual. As you start to master one step you will slowly shift your focus more and more to the next step until everything you learned from the previous step become subconscious. I believe I actually have read this article before. I just didn’t know it. Though I feel strongly that this sequence is the best way to improve it is important to remember that during each of these steps there are other things to practice. Your available practice partners will impact which things you can practice effectively. If you don’t have other people to practice with, coming up with new technology or highly situational techniques may be the only thing you can practice. Or maybe you just find solo practice to be a ton of fun. ou continually evaluate your habits every step. It can be something simple such as my wave dash is always shorter in game than in practice or I jump immediately whenever I get hit or something as complicated as I always get mind-gamed when Marth crosses up my shield to do something stupid out of shield and get punished by a pivot forward smash. Old habits die hard and this is true in Melee as in any other game. Muscle memory is essential for getting your shuffles down but autopilot is the enemy of mindful improvement and thus muscle memory is often the biggest hindrance to growth. I talked about it before – one of my biggest bad habits is that I spam dash attacks with Peach. It’s been said time and time again that the first thing any new players should practice is tech skill. This starts with short hops, shuffles and wave dashes. So short hops, wave dash is definitely something I need to work on. Once these are out of the way more character specific technology awaits. Same as players may choose to practice UpB out of shield, Falcons need to learn reverse lasers. Falcons should master pivots. For example, although it’s not listed here, but peach you’ve got your float cancel areas and things like that. Different characters have different tech skills requirements but no character is free from requiring tech skill. This phase is about learning basic tech skills that does not touch into truly difficult stuff, like haxdashes or invincible waveland up smashes. Nonetheless, to a new player it would be supremely impressive to get past this phase in even a few months. Experienced players often forget how hard it is to have any control over your character when starting out. Keep in mind that mastering a technique in solo practice is only the first step. After this you have to learn to do it under pressure and then you have to learn how to apply it. I’m definitely finding that I am getting better and better at wave dashing in practice. In friendlies, they go out the door. I can sometimes get a wave dash or two in and as soon as I get to tournament they are gone. I can’t apply them in tournament at all. The application of any given thing is you only learn just by spamming it and figuring out which situation it’s useful through trial and error. You start to have an idea of when wave dashing and some other techniques are good but there’s no way to come close to understanding the application of everything at this step. This is probably the stage that I’m at. I’ve been playing for a year but I’m still at this stage where my tech skill is very scruffy. It is not very good and so it needs a little work. I still do not have the controlled movement over my character. The next thing to focus on is punish game. That is something that I know I have heard talked about before is that if you get an opportunity and you can roll through and get a lot of damage on them then you are going to kill them a lot faster than new players who just get one hit, run away or they get an opportunity there and get one hit they get 10% damage and they’ve got to get 10 opportunities to win a stock, whereas good players like I’m not I might only need one, two or three opportunities to take an entire stock. The next thing to focus on is punish game. Though the neutral games are arguably more important the punish game it is easier to focus on. Neutral game improvement involves understanding of mind-games, positional advantages, etc. Knowledge of most of these things actually comes quite naturally with experience. The punish game is something that like tech skill is largely contingent on your own execution and not on interaction with the opponent. Waveshine, upsmash, stomp knee, chain grabs, frame perfect aerials can be practiced just by focusing on yourself during a match. Master your own hit boxes, learn the frame data and learn to be precise with your character. This is the time when good players can most easily give good advice. So you should solicit it as soon as you feel your tech skill is solid. Bad move selection is a glaringly obvious deficiency in most new players and it’s easy to say you should have up smashed there or you need to learn to use your invincibility to ledge guard against that. Most people plateau during this phase because they don’t give adequate focus. There’s vast amount of progress to be made in this step. Improving your control and punish game is not only one of the easiest ways to improve but also one of the most gratifying. There are few other times when your improvement will be so immediately apparent both on screen and in your results. When starting Melee the first year or maybe even two if you aren’t dedicating much time to it, it’s best spent learning to have perfect control over your own character. So I think that’s where I’m at the moment, learning to have perfect control over my own character. The third step is DI. Although you may think DI a simple input and could be learned earlier, it takes focus on the opponent. You have to watch them. Really, if you’re a competent player you should actually be watching your opponent over time time and never focusing on yourself. But this takes too much concentration to practice for a new player and focusing on it sooner will impede improvement of other things that are more easily practicable. This kind of brings me up to the stage that I’m at. Learning to control the movement of my character is something that I need to focus on. Punish game is still something that I can focus on and I’m slowly learning about different things that I can do. It was only a couple of months ago that I learned about if I do a down tilt on Sheik it is almost a guaranteed follow up. But with that punish as well, I could do down tilt and if I could convert that into an up air then I could potentially extend that punish. So the moment of down tilting and then getting like an air or something in those medium percent ranges but if I could get up an up air then I could improve my punish game. Therefore, movement as well as punish game and understanding that, like I know against fast forwards with peach there, there is a punish where if you get a down smashing I think you can up air up air reverse by an air and so you can get a good punish there and get them off the stage but it’s beyond my skill level at the moment. So the third step is DI and focusing on the other player which I’m not up to. The fourth step is neutral game. And I’m probably not up to that yet. This is where you learn everything about every other character. You learn their ranges, their recovery options, the frame data, their positional weaknesses. Learning about other characters, I’m definitely not up to that. The beauty of the game doesn’t shine through until we’re at stage four where we’re learning about the other characters. A few things that come to my mind that puzzled me for years, I always heard about stage control and the momentum of the match. It was difficult to see how control of the match influence decisions about when to attack and went to a avoid it. The lack of understanding of these concepts is obvious in new players because they have frequently throw out attacks from defensive situations. As your ability to understand other characters blossoms so will your ability to mind game other people. After hearing rolling is bad for years, step four is when you should finally have enough situational understanding, to bait and punish them. Once you understand the options a character has, the brilliance behind the decisions of top players becomes clear. So we are not up to that. The last age is innovation. It is talking about understanding your limits, the movement options, you don’t drop combos anymore, you have beaten some respectable players and now your own style is emerging. This is talking about just innovating and doing things that I guess haven’t been done before or testing new things out. It is a tutoring step for say you are not really in a position to innovate because obviously like you don’t have full control of your character, your punish games not down, your DI might not be great and your neutral game still needs work. So I can see why there’s no room for innovation because there are still other things you need to focus on. As a final note, learning teams should happen during phase two or three. So if you can precisely place attacks or play teams, DI it’s easier because holding in is mostly good all of the time and rolling and take habits are less problematic. I don’t really have the time for teams so unfortunately that is not for me. This is a good article. I really liked this article. I’m in phase one clearly where I need to focus on the movement of my character, get my wave dashes down, get my dash dances better, short hops as well is something that I need to work on. I guess I’m slowly progressing into understanding more of the punish game but being able to have full control of my character is something that I guess I need to work on. I am going to close out there for today. I will be reading a few more articles in the coming weeks but I think this week with the games that I have to watch over and to analyze and to improve on as well as I need to practice wave dashing, dash dancing and general movement of my character, I think I’ve got enough to focus on for this week. I’ll be back with the next episode soon. Until next time you go out there and have fun and I’ll see you in the next episode on Melee.co.